Another blast from the past hahaha since photos from Halloween aren't uploaded yet. 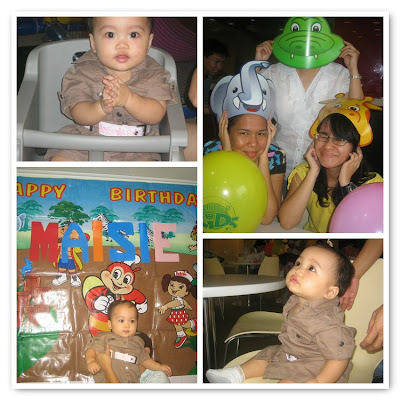 These were taken during her first birthday celebration. What a sweet baby, Marice. Happy Blue Monday. your bebe is very cute Sis..thanks for the visits in my blogs...take care! belated happy halloween from me and my blogs!! can't wait to see pinas soon! Thanks for stopping by. Looks like everyone had fun! So cute! I like her outfit. Happy Birthday! What a precious baby! I love the touches of blue that you've shared with us today. Have a wonderful Blue Monday. Looks like lots of fun...even when babies take it all so seriously. Thanks for the visit. What an adorable little baby girl. You have an awesome blog and I am going to follow..
Looks like a fun party ! cute photos!! Can't wait to see this year's Halloween! Your baby is so cute..